One of the biggest challenges mankind is facing is the population problem. Not only the living space but also the healthcare facilities are falling short as a big segment of it has reached the middle the age. The lack of medical facilities and limited availability of medical professionals will make it harder to manage the ailing population in the upcoming years. The average lifespan of the human race has also increased considerably due to various achievements of medical science. This is where the technological advancements will give birth to elegant platforms revolutionizing patient care and medical infrastructure. The healthcare industry has already crossed the mark of US$ 179.6 Billion by the end of 2016. In fact, the digital healthcare division will reach the mark of US$ 536.6 Billion by the end of 2025. It means that we are the on verge of witnessing the advent of a new 0.5 trillion US$ industry. The latest digital trends in the medical industry will set this record and introduce a new way to avail medical care in the upcoming years. The advent of more advanced imaging techniques such as 3D MRI is the proof of comprehensive research done that took us from the beginning of X-Ray machines to here. There are many more advancements to come in this field. Below is the list of healthcare IT trends that will surely increase the rate of advancement to a new level. The reason behind the emergence of this trend is the immense popularity of smart phones. The introduction of medical applications will change the mode of patient care. These are the specific phases where medical apps will become a part and parcel of this industry. here is How Mobile App Helps in Healthcare. The health records of the patients can now be availed and accessed by the medical professionals and other concerned persons. It means that the patient care will get an immense boost from the quick medical record access done by the professionals. The powerful applications will also link diverse platforms together to bring more integrity and cooperation in the industry. All the departments in a hospital will be able to connect easily via a single digital platform. The professionals will be able to access patient data and speed up the treatment process. The biggest constraint of patient education regarding medications, test, drug interactions, and other activities will now become easier to explain and record. The communication platform via these revolutionary medical apps will redefine healthcare. The innovative AI platforms will also provide an excellent FAQ section to deal with patient enquiries right away. The ‘Internet of Things’ concept has already invaded our homes and will be seen in the medical industry as well. This new concept is renamed in this domain as the ‘Internet of Medical Devices’ or IoMT. This healthcare innovation will bring a cross platform to link all the medical devices used by the doctors and other medical professionals. The market of IoMT devices in healthcare technology will increase to US$ 409.9 Billion by the end of 2022. The experts stipulate that more that 40% of the IoT devices available in the market will be used in the medical industry within 2021. Every patient has a code to carry. Every essential product and treatment is coded with the same barcode so that any anomaly can be tracked down right away. This is where the new health care IT trends will bring a new chapter. The asset tracking system will become better and accurate thus removing the chances of any mistakes in the near future. In fact, providing the right measures at the designated time will become easier. The probability of any medical mistake is 1/300. This statistical value will be reduced considerably when the medical professionals get a brilliant digital platform to track down assets or essentials. With the advent of IoMT, drug administration and management will become very easy for the professionals. It will help them to free more time and provide individual care to many patients. The advent of Big Data, machine learning, and AI will enable the systems to analyze a huge volume of data for predictions. The AI platforms are capable of analyzing data faster and better, providing elegant solutions to the medical professionals. Suggesting treatment, detecting diseases, and predicting readmission will be done by the AI. It has been found that an AI platform has shown 95% accuracy in tracing and diagnosing cancer. The administrative task will need less human intervention. An estimated US$ 150 Billion will be saved on using AI platform every year by 2026. This is one of the ideal future trends in healthcare technology that will introduce smart devices, smart interactive platforms, medical imaging, managing supply chain, etc. The introduction of blockchain technology and cloud storage resources will give the best output for the healthcare industry. No data will be lost as the devices in the system will be used for collaborating data, maintaining transparency, and for preparing smart contracts. This is a new technology in healthcare that will make it easier for the professionals to share and access patient-related data. Internet safety will also increase manifold. The introduction of wearable technology will aid the healthcare industry to track the conditions of a patient post-treatment. The data will be seen in a readable format. In fact, the collected data can also be used for better statistical analysis. The collaboration of technology and healthcare will be a blessing for the older population segment. These are the healthcare industry trends that will reshape the medical care a patient can avail in the upcoming years. 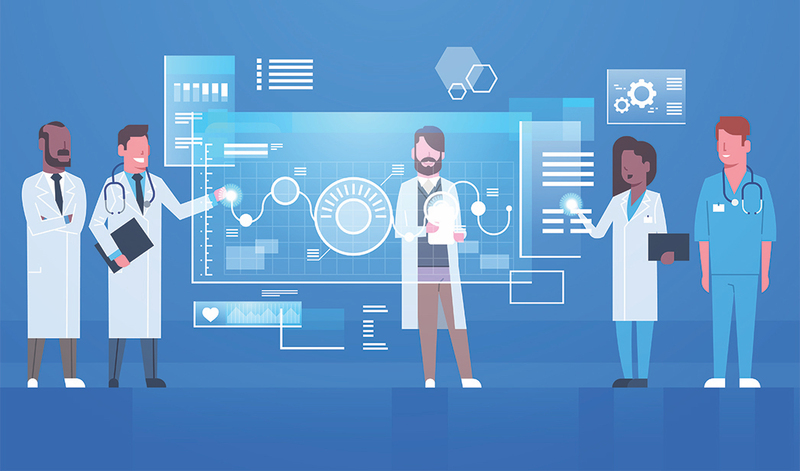 A health care industry trend fused with technological advancements will give birth to better treatment, less risk, proper care, and accurate analytical results. These current trends in healthcare will prepare a new dimension for the emergence of better practices in the industry.